Today is the feast day of Saint Athanasius, the 20th bishop of Alexandria who lived from c. 296 – 373. He is best known for his strong convictions and his lead role in the First Council of Nicaea against the Arian heresy in 325. At the root of the Arian heresy was the holding that Jesus Christ is of a different substance (separate) from God the Father. 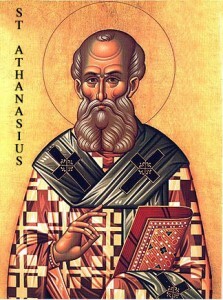 Athanasius proved himself to be a pillar of strong theology and orthodoxy, holding fast to the truth of the divinity of Christ. Athanasius engaged in this struggle against the Arians for most of his life and this earned him five official exiles from four different Roman emporers, not including six more instances where he was forced from Alexandria for his own personal safety. If the world goes against Truth, then Athanasius goes against the world. I believe that his wisdom applies directly to the situation we find ourselves in today as a Church. Today (at least in the United States), we have a legion of under-catechized, lukewarm Catholics that do not know the tenants of their Faith. They allow themselves to be molded not by the Truth, but by a secular culture that wants everyone to “get along to get along” and in doing so distorts the actual teachings of Jesus. This leads people toward the dangerous precipice of a life lived apart from Christ. The quotation above should be the clarion call of all faithful Catholics. We are called to be witnesses of the absolute Truth of Christ even if that causes us persecution, exile, pain, or death. Saint Athanasius embodied these virtues throughout his life, and I can identify with the necessity of such conviction. It is easy for us to be steamrolled by popular opinion, political tides, or well-intentioned but ignorant friends and family. Our goal, following in the footsteps of this great saint, is to be educated in the Faith, to recognize the Truth, and to accurately and ardently present that Truth to those that would erode or ignore it. 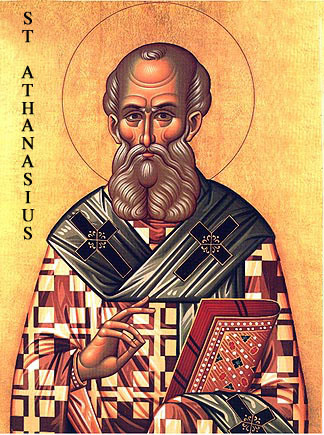 Saint Athanasius, pray for us!